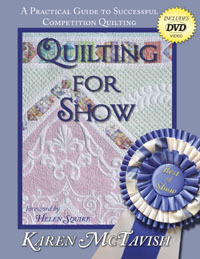 Quilting for Show showcases the nations' best quilts and shares practical, quilt construction knowledge (includes DVD). Showcases the nations' best quilts and shares practical, quilt construction knowledge. This book is out of print but a used copy may be ordered from amazon.com. Quilting for Show ~ A Practical Guide to Successful Competition Quilting showcases a collection of the nations' best quilts and quiltmakers. Karen explains what it means to quilt for show, how to go about finding a show, what to expect from judges, what kind of behavior is ethical, what to do about photography, how to ship your quilt to a show and why appraisals are important. She also shares practical, quilt construction knowledge such as how to bury your threads, how to block a quilt, how to add a sleeve and how to quilt like a hand quilter. This book is organized into 4 main sections to guide the reader towards successful competition quilting: Inspiration, Before the Show, Into the Minds of Judges and Quilting Concepts - the practical guide to quilting. Each section includes multiple examples of award winning quilts with comments and advice from the quiltmakers. Helen Squire, Caryl Bryer Fallert, Diane Gaudynski, Ricky Tims, Sharon Schamber, Hollis Chatelain, Linda Taylor, Linda McCuean, Carol Selepec, Myrna Ficken, Kim Brunner, Carie Shields, Anita Kris Mattson, Jean Carlton (quilt appraiser) and Pepper Cory (judge) add their collective wisdom to Karen's instruction on what it takes to quilt for show. This book is softcover, 112 pages, features 25 award winning quilts in full color with close-up pictures of quilting details, and includes a DVD* with detailed lessons in blocking a quilt, applying a sleeve and learning to quilt like a hand quilter. It retails for $24.95. If you are interested in inviting Karen McTavish to lecture or teach a workshop (and do a book signing) for your quilt expo, store, guild or other group, please contact her directly at karen (at) mctavishquilting (dot) com. First, try playing your DVD on another DVD player or on your computer. Also, if you are playing your DVD on your computer, make sure you have a DVD drive, not just a CD drive. DVDs and CDs look the same but they are not. If you are having trouble getting the whole DVD to play in sequence on your DVD player, go back to the "main menu" on your DVD and highlight each chapter that you want to view. Not all DVD players will play the DVD from start to finish. If none of this works, email us and we will work to resolve the problem. If your DVD is cracked or defective, we will replace it. Love this book and the DVD that is included. It's very informative, especially if you are just beginning to enter your work into quilt shows. It tells you what the judges are looking for in a winning quilt. I even took the binding off of a quilt and redid it after watching the DVD. Lots of pictures of beautiful quilts, lots of inspiration. I have been quilting on my domestic sewing machine for 9 years now , I even teach, and the amount of informations in this book is fantastic. Little hints , the list of judges comments , and to know that all those wonderful quilters have started like us. Quilting just for the pleasure or quilting for shows, it is a must have book. In this book you find examples of the best show quilts of the last decade acompanied with tips and tricks to get your quilting to a next level. The DVD is very usefull. I loved the book and read it cover to cover. Great book. Very helpful. I hope to use the ideas in the book to improve the quality of my own quilts, and just maybe I might have the courage to enter one in a competiton sometime soon. I ordered your book Quilting for Show from you and it has just arrived. Normally I wouldn't email an author, I figure you probably have so many it must get to be a bother. However I've just been blown away by my first look through the book and am inspired to great heights. I'm a really average quilter who loves the process, but that doesn't mean the product is show standard, but your book has inspired me to step up a notch and take more care and consideration. I might even try to design something and enter this year's Festival of Quilts here in Adelaide, South Australia. You are greatly admired here in Australia, your name is really well known. If you should ever come here our guild would really welcome you (and ask you to speak to the ladies, we get 150 plus each month to our meetings), or visit our Festival of Quilts in November each year. Thank you for a wonderful book. In an artist's book, you wouldn't think "practical" would be a very interesting word. However, in this case, practical is perfect. Entering competitions is a scary concept. You are putting yourself out there for other people to judge, and that isn't often comfortable. Therefore, you want to do your best. Karen is utterly amazing at making sure that, when you are ready to enter your quilt in a contest, you are actually "ready". You know that you are entering a quilt that is not only beautiful to you, but is also technically proficient. You wouldn't go to a job interview with your slip hanging below your skirt, or your shirt partially tucked. Think of it this way - you are sending your quilt for a very important interview - you want her to look her best! Karen helps you do that. There is even an included CD which, for those more 'visual' of us (and aren't we all, as quilters, visual to the max?) which leads you through instructions for how to do some of the more detailed (no, don't read "difficult" here) methods, like making really pretty feather quilting patterns. Overall, a great investment. And don't think that, because you aren't planning on entering a quilt in a show, that this book wouldn't be of great use. We all want to learn and do work we are proud of, and this lovely little book will certainly help you to do so. I was looking for ideas regarding quilting designs and got so much more. Karen's books often include DVDs and this one is invaluable to learn how to do some very basic techniques. Squaring up a quilt, top notch binding and sleeve instructions to name a few. Every quilter can learn how to improve even if you never plan to enter your quilts in a show.